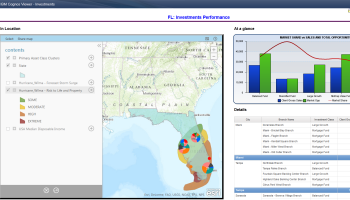 Esri Maps for IBM Cognos seamlessly integrates with IBM Cognos 10, allowing report authors to add and configure maps that interact with other objects in their IBM Cognos reports. Note: Esri Maps for IBM Cognos has been retired effective February 01, 2019 [PDF] and is no longer available for download. 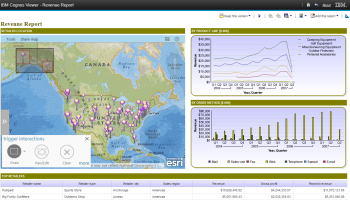 If you have already downloaded Esri Maps for IBM Cognos, you can continue to use it. Read more about its product lifecycle support status. 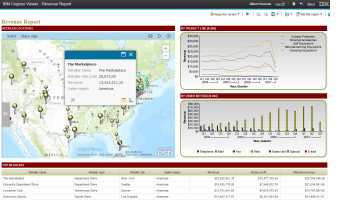 Add dynamic maps to your IBM Cognos report to help you analyze your business data visually. Make reports more interactive for report consumers. 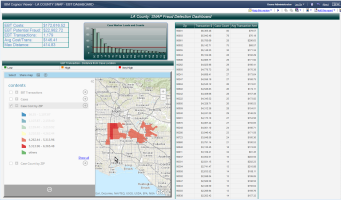 Select features on the map to update other report objects, set a prompt, or drill through to an external report. Share maps or individual map layers to ArcGIS for use by others in or outside of your organization.